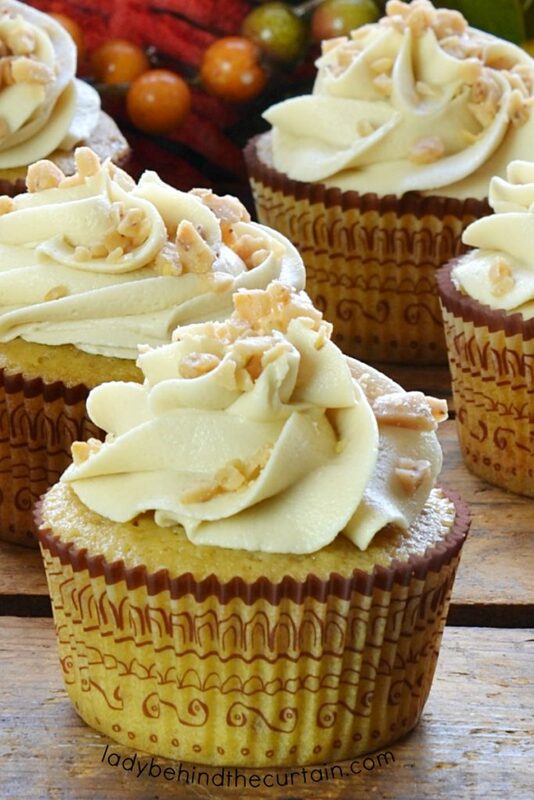 Praline Frosting | A light and fluffy caramel flavored frosting that will quickly become one of your favorite frostings to make. 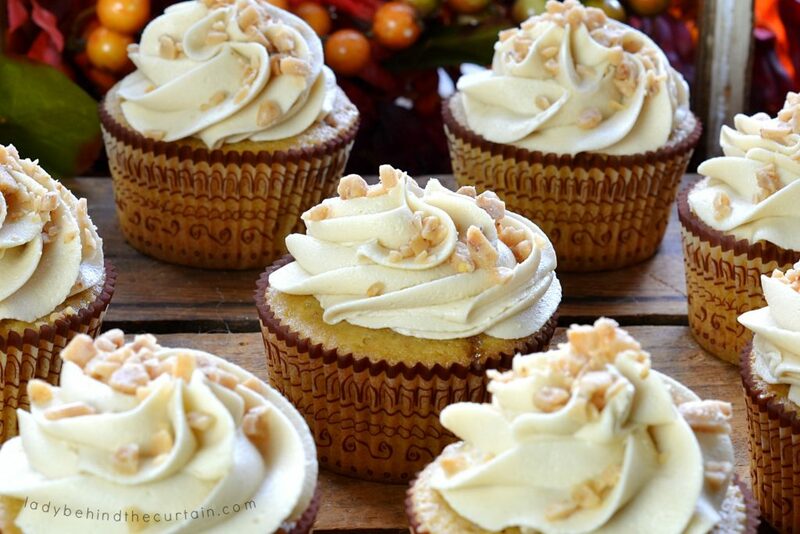 Create another layer of praline and add this delicious Praline Frosting to Praline Cupcakes. Watch as the buzz around the room begins and one by one your guests race to the dessert table! WHAT MAKES THIS FROSTING TASTE LIKE CARAMEL WHEN THERE’S NO CARAMEL IN IT? The rich caramel flavor is accomplished by adding dark brown sugar. 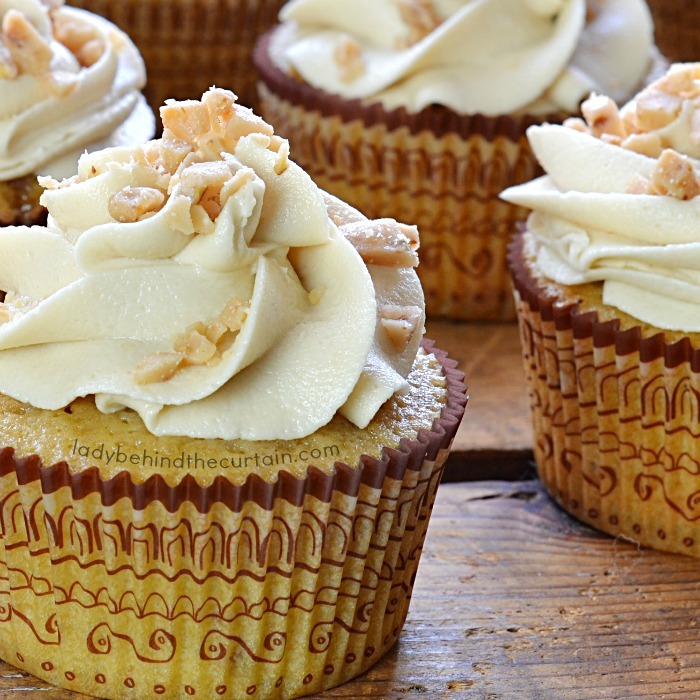 Heat is the winning factor to achieving a creamy frosting when using brown sugar. No grainy texture! So plan ahead for this frosting! Once the butter, sugar and whipping cream are heated and the sugar is melted you will need to let it sit on the counter to cool. This will take about an hour. The last thing you want it for it to melt the remaining butter, so be patient. If after looking at the recipe you’ve decided this isn’t the right one… don’t worry I have many many more frosting recipes. Click here for over 40 recipes—->>>>FROSTING RECIPES. You can freeze frosting? Making homemade cupcakes and frosting just got a whole lot easier! To freeze your frosting: Spoon the frosting into a labeled zip top bag and freeze. When ready to use, place the bag on the counter to come to room temperature. Spoon into a large mixing bowl. Whip on medium high for 3 to 5 minutes. This is to incorporate air back into the frosting for a light and fluffy texture. In a small saucepan, combine brown sugar, cream and 2 tablespoons butter. Cook over medium heat, stirring frequently, until sugar dissolves. Set aside to cool completely (about 1 hour). In a large mixing bowl, beat remaining 1 cup butter and brown sugar mixture at medium speed until creamy (about 3 minutes) Make sure to scrap down the sides. Gradually add powdered sugar, beating until smooth. Once all the powdered sugar has been incorporated scrap down the sides and turn the mixer on medium high and continue beating an additional 3 minutes. More recipes you might like. EASY SPICE CAKE and FROSTED BANANA CAKE.